Blog Home / getting started / What is an LED? It seems that everything these days has an LED in it. 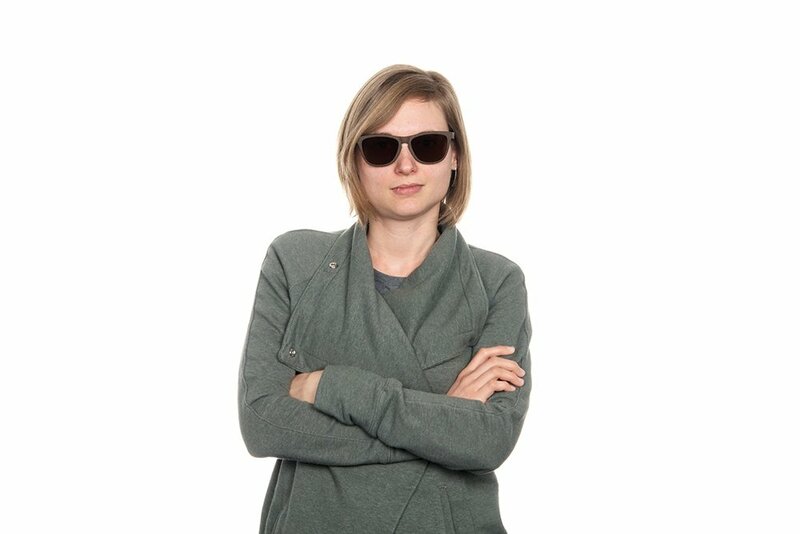 But what are LEDs, and why are they so popular? Let’s take a look. LEDs, or light-emitting diodes, are a particular type of diode that converts electrical energy into light. Essentially, they are tiny light bulbs that can be used in an electrical circuit. Two of the many benefits LEDs have over traditional light bulbs are that they require a lot less power to light up and are more energy efficient, meaning they turn more of the energy that passes through them into light and less into heat. Within an LED, current can only flow from the anode (positive side) to the cathode (negative side) and never in the opposite direction. This means that if put into a circuit backward, an LED will not light up. In fact, a backward LED can prevent an entire circuit from operating properly by blocking the current flow past that point. The first thing you should try if an LED doesn’t light up when placed in a circuit is flipping it around. The brightness of an LED is directly dependent on how much current it draws. This means that super bright LEDs will drain batteries much quicker than dimmer LEDs. Luckily, it is possible to control the brightness of an LED by controlling how much current passes through it. In fact, controlling the current through an LED is important for a few reasons. When connected directly to a current source, an LED will try to dissipate as much power as it is allowed to draw. When there is too much current available for the LED to handle, the LED will burn itself out and die. For this reason, it is important to limit the amount of current flowing through an LED. 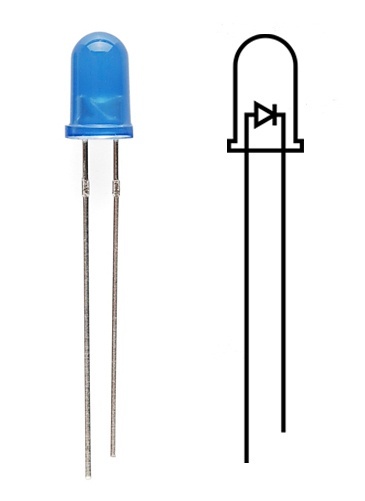 To control the amount of power flowing through an LED, resistors are crucial. Resistors limit the flow of electrons in the circuit and prevent the LED from trying to draw too much current. We will dive deeper into resistors in another post, but for now the important thing to know is that the basic template for an LED circuit includes connecting a power source, resistor and LED in series, as shown below. Some basic math can be used to determine the best resistor value, but for the purpose of this discussion, and for most LEDs, 330 ohm is a good place to start. 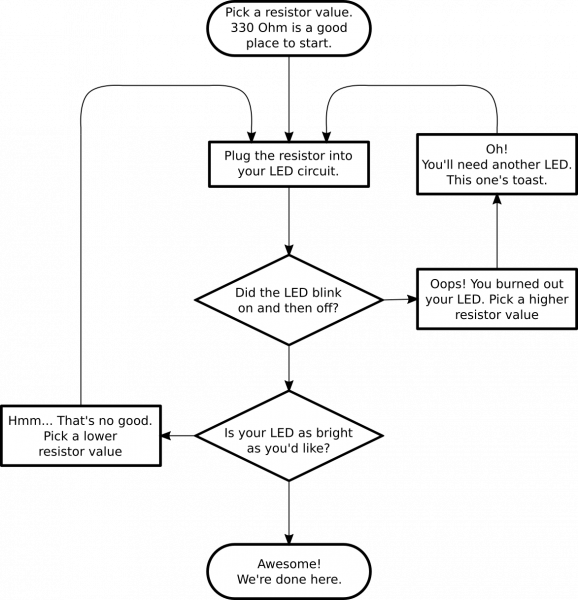 As such, here is a handy flowchart to help you design an LED circuit and select the proper resistor value using trial and error. 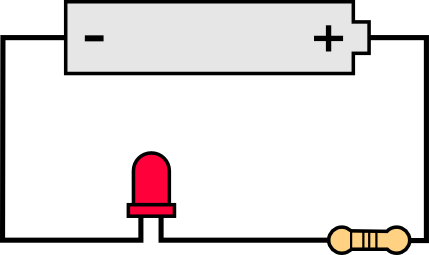 The simplest way to light up an LED is to connect it to a coin cell battery. This method works without a resistor because coin cell batteries don’t source enough power to damage the LED. This is a great way to demonstrate the importance of placing the LED the correct way within the circuit — if it’s backward, the LED won’t light up. Simply place the long end of the LED (the positive side) against the “+” side of the battery and place the short end of the LED (the negative side) against the “-” side of the battery, and your LED will light up. To learn more about LEDs, check out our Light-Emitting Diode tutorial. Interested in learning how LEDs are made? We had the chance to tour an LED factory a few years ago.